The International Numismatic Congress has taken place in the Palazzo dei Congressi in Taormina in 2015 September 21-25. The successful XV International Congress of Numismatics, Taormina 21-25 September 2015, was attended by 720 participants who came from 44 different nations (including Australia, India, Japan and China). The majority of the 422 papers and 53 posters that were presented are published in the Proceedings, Volume I-II. The logo of a winged triskelés for the XVth International Numismatic Congress Messina/Taormina 2015 was inspired by a bronze coin of Syracuse under Agathocles (at the end of the IV century BC) and was designed by Cecilia Caccamo. Even if it reminds of the Sicilian Trinacria, the aim of Maria Caltabiano, Chair of the scientific Committee, is that the image of the three legs might suggest a dynamic movement towards the acknowledgement of the coin as a witness of historical events and cultural landscapes. 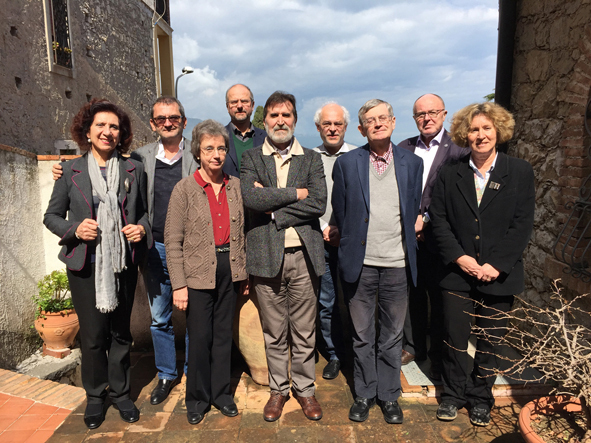 Meeting in May 2013: INC Board and XV Congress Scientific Committee: from l. r.: M. Puglisi, C. Arnold-Biucchi, E. Arslan, D. Bateson, M. Alram, B. Zäch, T. Talvio, D. Castrizio, L. Travaini, B. Ziegaus, M. Caccamo Caltabiano, P. P. Ripollès. 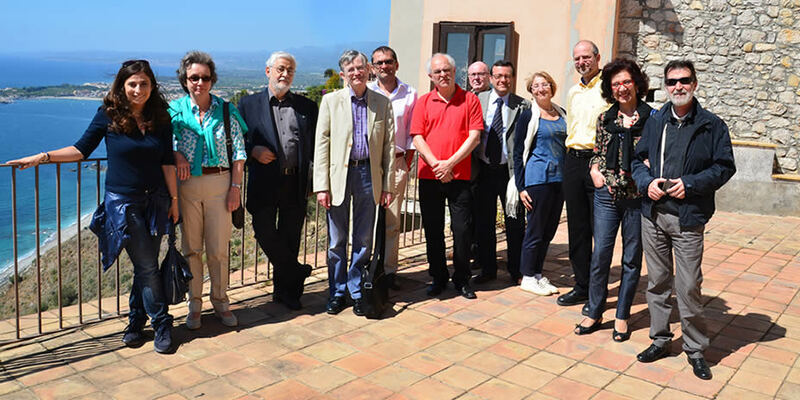 The Committee 2009-2015 from l. to r.: Maria Caccamo Caltabiano (Organizer of the Congress in Messina/Taormina), Michael Alram (Vice President), Carmen Arnold-Biucchi (President), Bernward Ziegaus, Pere Pau Ripollès, Benedikt Zäch (Vice President), Donald Bateson (Vice President), Tuukka Talvio, Sylviane Estiot.